The Raceway ATV MX Shower Curtain is a PERFECT way to tie in your bathroom with the NEW MX bedding, pennants, posters, trashcans and blankets that help make up your Motocross themed bedroom. 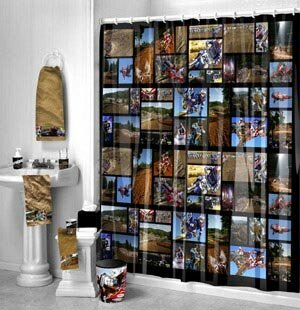 The Raceway MX Shower curtain is made of 100% polyester and features a sublimated collage of photos that is sure to get you excited for your next trip to the track. Size: 70" x 72"